Sumo makes its yearly stop in steamy Nagoya starting Sunday, with Kakuryu aiming for a third straight title at the only venue where he has yet to raise the Emperor’s Cup. If the yokozuna emerges victorious at the end of the two weeks, he’ll have stretched Mongolian dominance of the Nagoya tournament to a 15th straight year. Since 2004, only three men — Asashoryu, Hakuho and Harumafuji — have won championships in Japan’s third-largest metropolis. That’s in large part to the July meet being the most physically taxing on the sumo calendar, with its energy-sapping heat and humidity placing great strain on wrestlers bodies. Only those in peak condition do well there. In Nagoya, where temperatures in July rarely fall below 30 degrees Celsius, with humidity at 80 percent and higher, even sumo wrestlers struggle to handle the sauna-like conditions, with many if not most stables forced to train out in the open air. Things are little better at the newly renamed ‘Dolphin’s Arena’ (Aichi Prefectural Gym). The air-conditioning at the venue, which has hosted the Nagoya tournament since the mid-1960s, is barely noticeable ringside. Its ineffectiveness gives rise to one of the trademark sights of the July meet — spectators furiously fanning themselves with fans given out for free at the arena. It isn’t just the weather that makes Nagoya different, though. 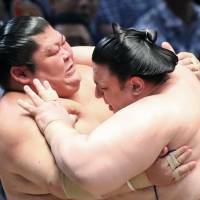 It differs from the other tournaments in ways that offer sumo fans in the region unique experiences. The most striking comes on the final day after the conclusion of the trophy presentation and related ceremonies. Fans rush the ring and tear it to pieces. Many bring spades and other tools in order to get a prized piece of the straw bales or clay. In the shocking free-for-all, it’s every man for himself — and every woman for herself as sumo’s gender restrictions are tossed aside like a jonidan division wrestler facing Hakuho. The open-air nature of training mentioned above also means fans can see wrestlers practicing at stables that are normally closed to the public. With temples and shrines being popular options for stable’s temporary lodgings (they have the space for both accommodation and a ring), training sessions can often be observed from a distance without making any special arrangements. Kokonoe Stable, for example, generally only allows support club members to watch training in Tokyo but in July they are based at Tokugenji, a temple just a stone’s throw away from Nagoya Dome. And while they train inside, one whole wall is open, meaning visitors to the temple can watch the early-morning practice. Nagoya is also unique in that Chunichi co-sponsors the tournament, and the newspaper company is actively involved in its organization. Ticket sales for Nagoya also start in the middle of the May tournament — the only event for which that happens. 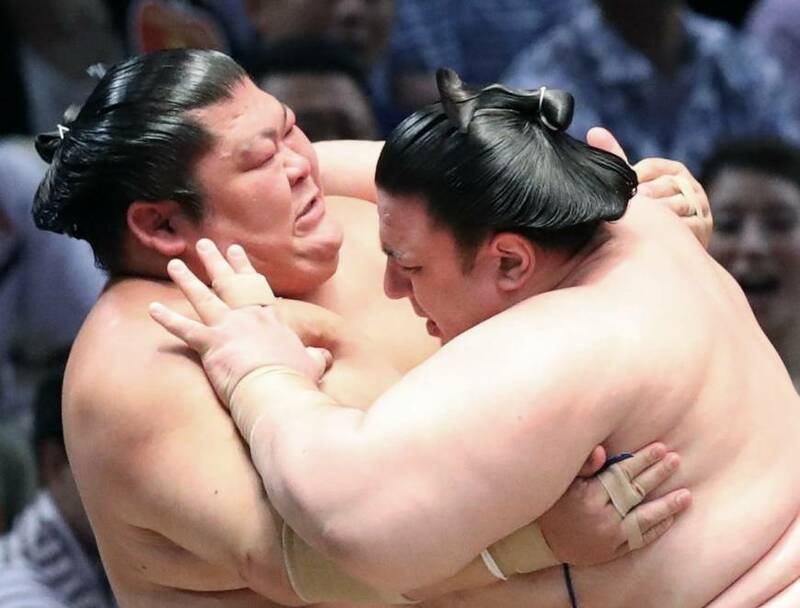 While the city itself isn’t a hotbed of sumo, with Akiseyama in the juryo division being the only man in the top two divisions from Aichi Prefecture, the action inside the ring is often fierce. The heat and conditions can push wrestlers, already stressed to the max, over the limit. A recent study at Poznan University of Medical Sciences in Poland confirmed that stress hormones like cortisol spike in hot weather, and anecdotal evidence bears that out in my experience. One rikishi who was tired of his stablemaster’s constant haranguing told me that he tried to throw his opponent onto him when he was a ringside judge in Nagoya. The July tournament was memorably where Asashoryu and Kyokushuzan carried on fighting in the dressing rooms after a bout, with the yokozuna smashing the wing mirror of his fellow Mongolian’s car afterward. The upcoming tournament isn’t likely to see a repeat of such incidents, but that doesn’t mean it will be short of hot stories. With two ozeki in danger of losing their rank, and Kisenosato (if he enters) possibly setting foot in the ring for the last time ever, the tension will be real from day one. Another former ozeki is providing Nagoya with something not seen in sumo before. A total of 195 men (not including those subsequently promoted to yokozuna) have held the rank since 1771. No one, before Terunofuji in the upcoming tournament, continued on after demotion to the makushita division was imminent. In fact, no winner of the Emperor’s Cup at any rank has remained active after falling out of the salaried ranks. My hot tip for the upcoming tournament is Onosho. The young gun (he turned 22 on July 4) is back in the top division after an injury dropped him to juryo. Already able to go toe to toe with the big guns, he will face a much lower level of opponent in July, and if fully healthy could pull off a surprise tournament win. If my prediction goes horribly awry, I’ll blame it on the heat.